I've been transporting more dogs on their way to foster and forever homes since I first posted about doing this. And today was a treat because I got to meet my first German Shorthaired Pointers (GSPs) in person. 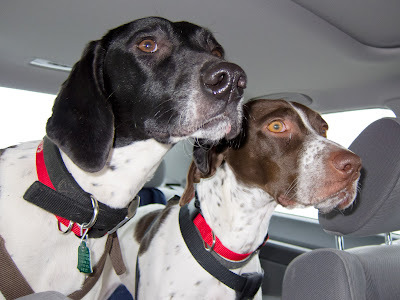 Someone on the NBRAN volunteer list forwarded a call for drivers for a "GSP Express" run for National GSP Rescue carrying two 2-year-old GSP females; since it was coming right through our area, I volunteered. And I fell in *love*. 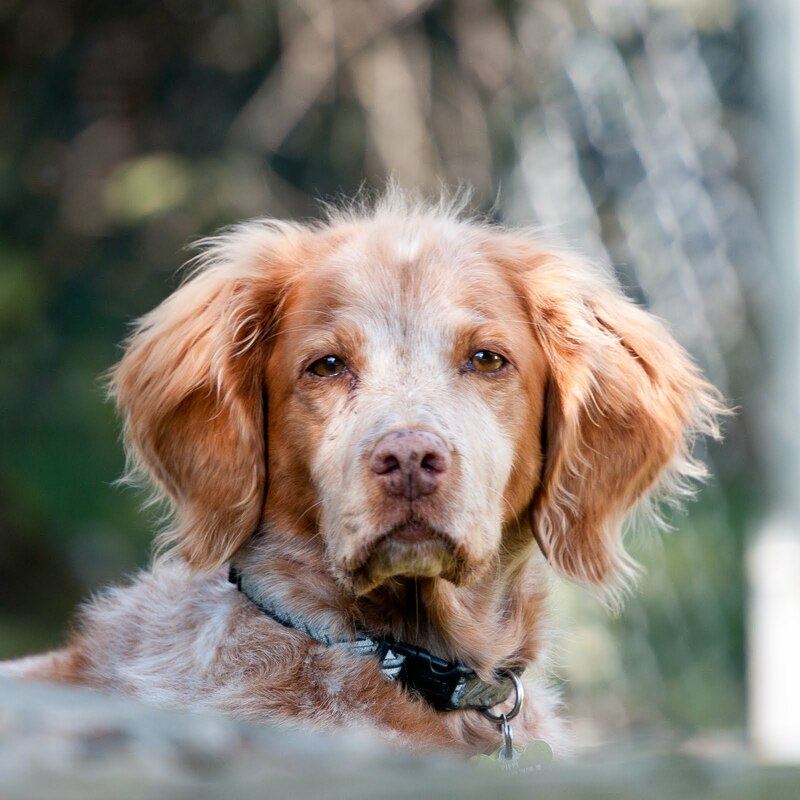 If it weren't for the fact that Bullock *really* doesn't want a second dog and we're not sure Pippi would be happy to have a dog friend, I'd be signing up to adopt a GSP right now. And Bullock was pretty charmed, too -- I took him along because these were young and rambunctious dogs, and I knew I wouldn't be able to drive and manage them at the same time. They look a little scared here (and wouldn't you be in their situation? ), and Cora kept a kind of curious and serious demeanor most of the time, but they were also eager to be petted and to give kisses in return, and they settled into the car almost immediately. Blue even rolled over for a belly rub as soon as she got in the car, and Cora rested her head on the back of my seat, next to my head, for most of the ride as she watched where we were going. Blue, meanwhile, rested her head on the console in between the seats -- all the better to get ear-scritches from Bullock. And they were hilariously bi-polar: in the car they were mellow and calm (Blue even slept soundly for half the ride), but out of the car during the exchanges from one driver to another, they were insane balls of excitement and energy. Blue tried to crawl over my back to get out of the car as I untethered their leashes from the seatbelts because getting out of the car was SO EXCITING she just couldn't wait! But both in and out they were full of kisses and doggy affection. Adorable! And just look at Cora's eyes and reddish-brown fur. Wouldn't she look great with Pippi? And apparently Blue's coloring is rare -- it's likely she comes from a true *German* GSP pedigree since black and white isn't yet recognized by the AKC as part of the breed standard. 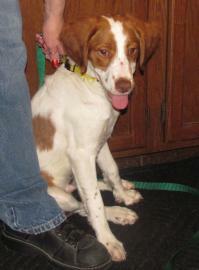 Or maybe she's part English Pointer (which does come in black and white). Eh, who cares -- she was a doll. It was hard to hand either of them over, and now they're already half way through the next state in their journey. Sigh. Anyway, before Cora and Blue, I did two more Brittany runs. I promise not to post about *every* run I do -- I'll generally stick to notable dogs. But since I could never get Toby, on that first run, to face the camera, I thought I'd give you the opposite now. Meet Silas, who wanted to know, "What's that thing you're pointing at me? Can I eat it?" 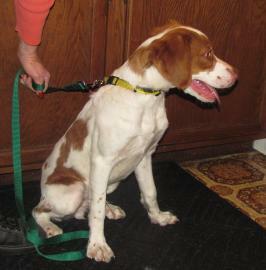 But don't fall in love with him -- turns out his foster already has and is adopting him. Hooray for Julio!